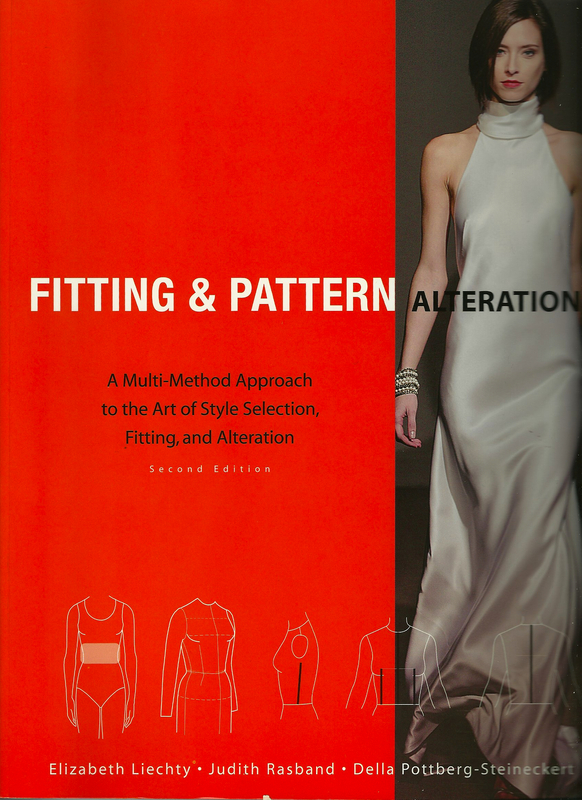 Fashion sewing is an interesting combination of inspiration, aspiration, indulgence and necessity, manifested singly or collectively. 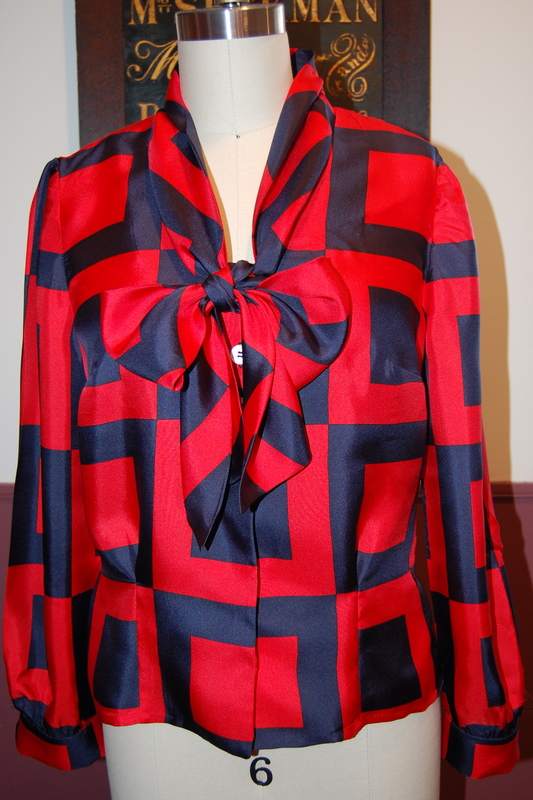 My newly completed bow blouse is an example of a bit of all of these motivations rolled into one. This is the blouse I made to go with my No. 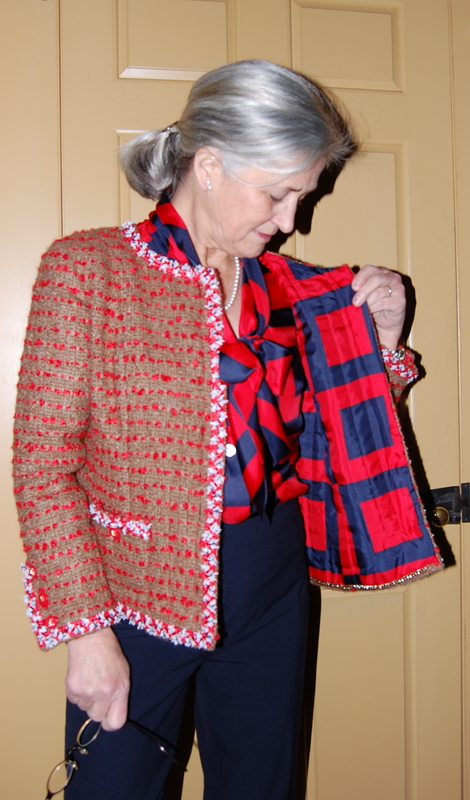 2 Chanel-inspired jacket, made from the same red and navy blue geometric print silk with which I lined the jacket. Inspiration came from several sources. 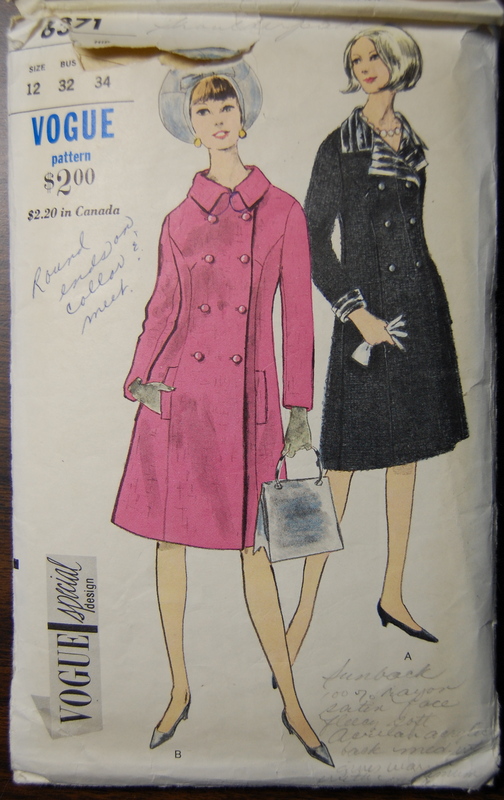 I was mostly inspired by the pattern, which is copyright 1957 by The Conde Nast Publications, Inc. (Vogue Patterns) – so much so, that I purchased it in a size larger than I usually wear, as that was what was available – and with vintage patterns, one is never sure to find a favorite one again soon – or ever. 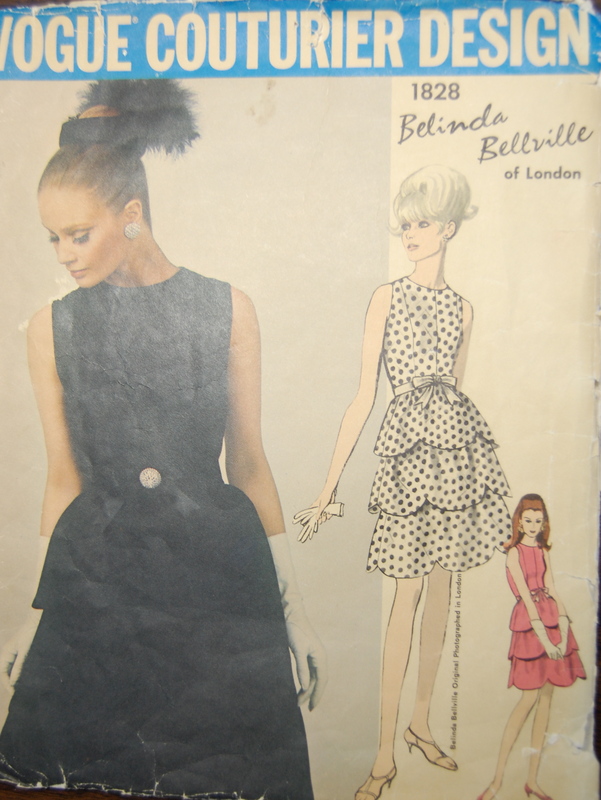 The blouse was featured in the December/January 1957-58 issue. 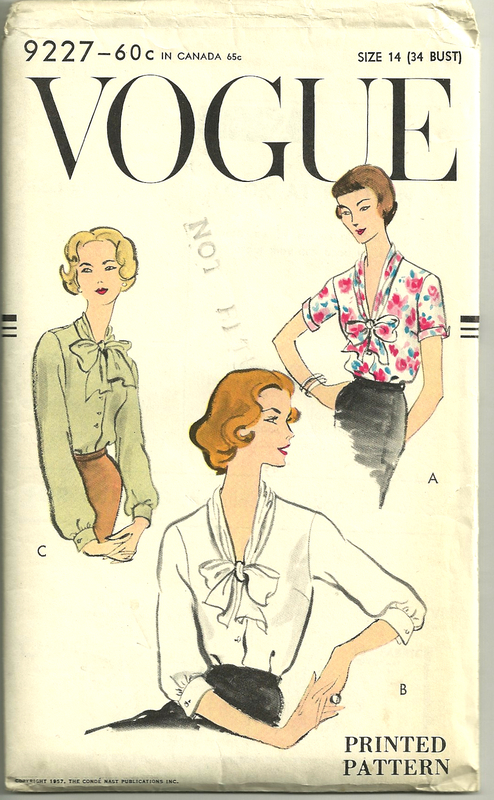 Part of a feature entitled “A new era for the soft BLOUSE.” In the August/September, 1957 issue of VPB. After making a sheath dress to coordinate with my Chanel-inspired jacket No. 1, I aspired to pair my Jacket No. 2 with a suitable companion, too. 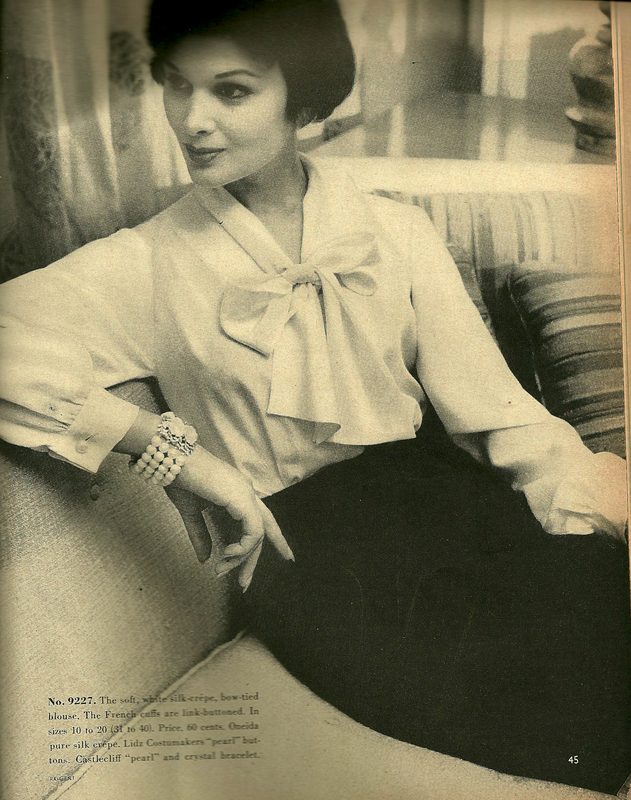 A bow blouse seemed to be a versatile and useful solution. And then it became a necessity! I decided my Jacket No. 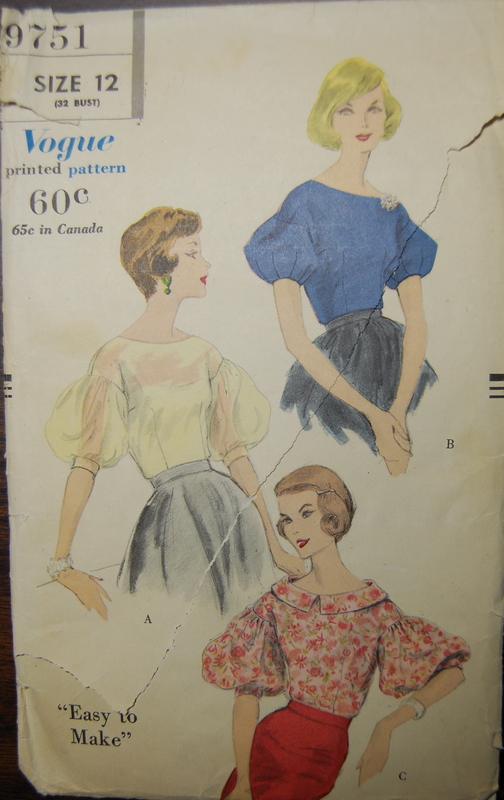 2 would not be complete until I finished this blouse. My muslin showed me that the sleeves were also a little too full for me and for current 2014 styles, so I removed some girth from them as well. 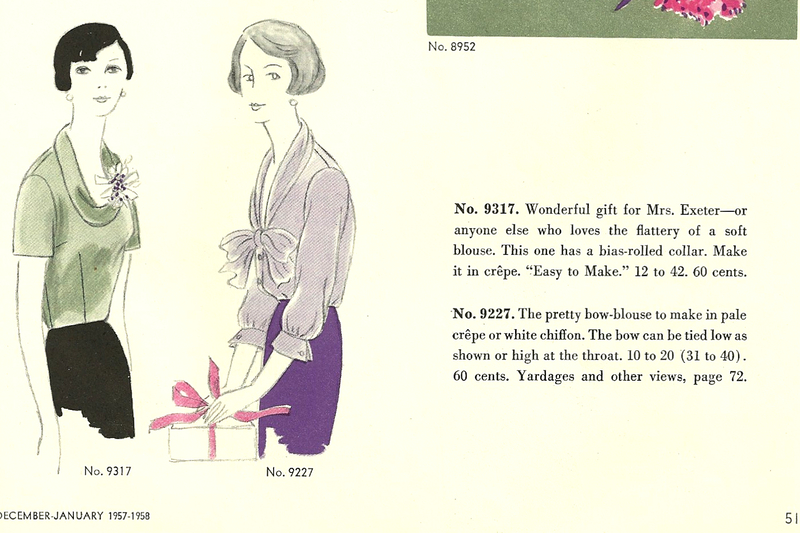 I was skeptical of the bow (cut on the diagonal) when I looked at the pattern and then the muslin. Would it be too full? Made up in muslin it seemed a little overwhelming. 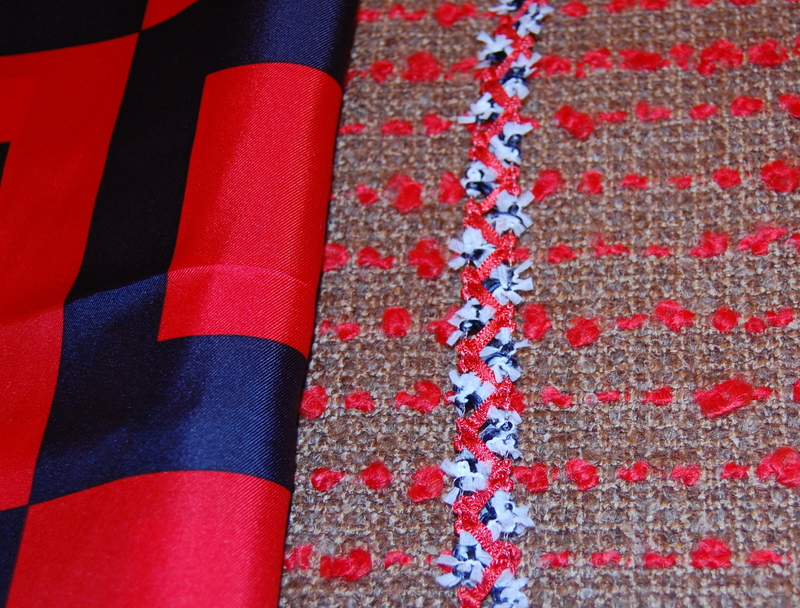 But, my silk was so lightweight and fine, that I decided it might just be okay, using the original dimensions. 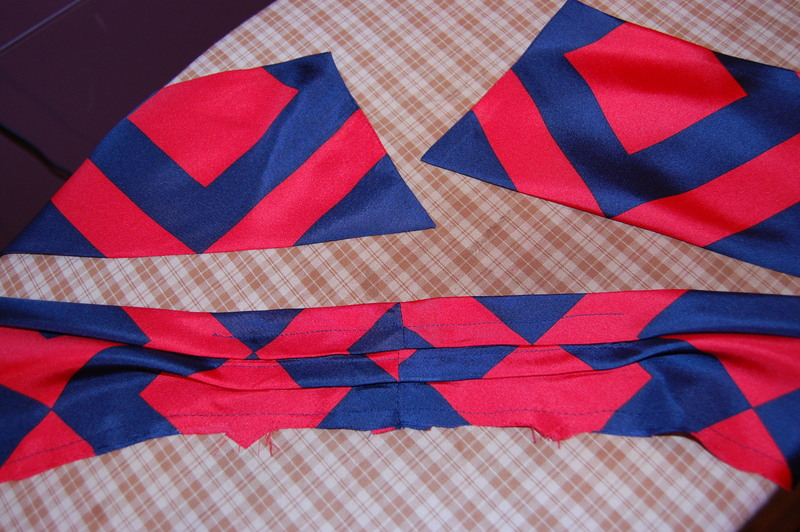 Here is the bow/collar ready to be attached to the body of the blouse. 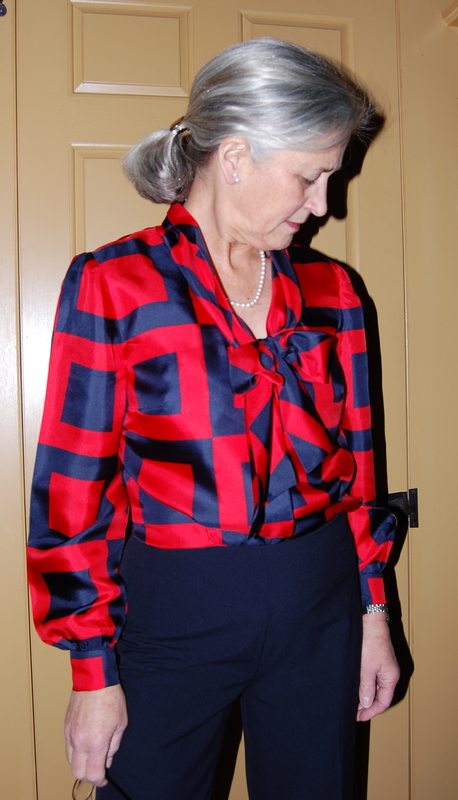 This blouse went together quite as planned, although I worked on one side where the bow/collar joins the corner at the front facing for hours, until I had it inserted correctly. I kept making the same mistake over and over, which was a little irritating. 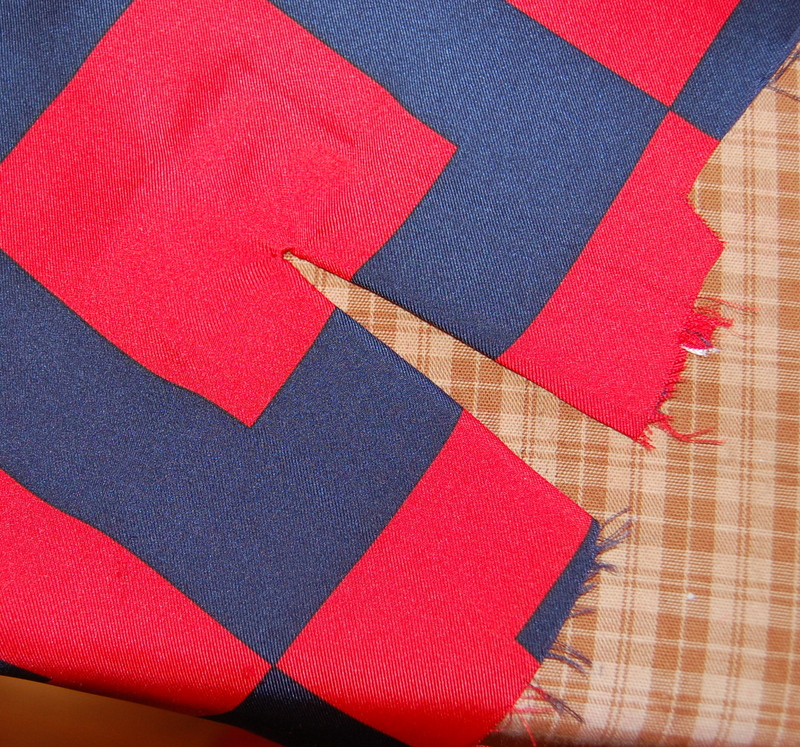 I also added some extra hand-sewing, understitching the facing by hand and hand-stitching the hem. 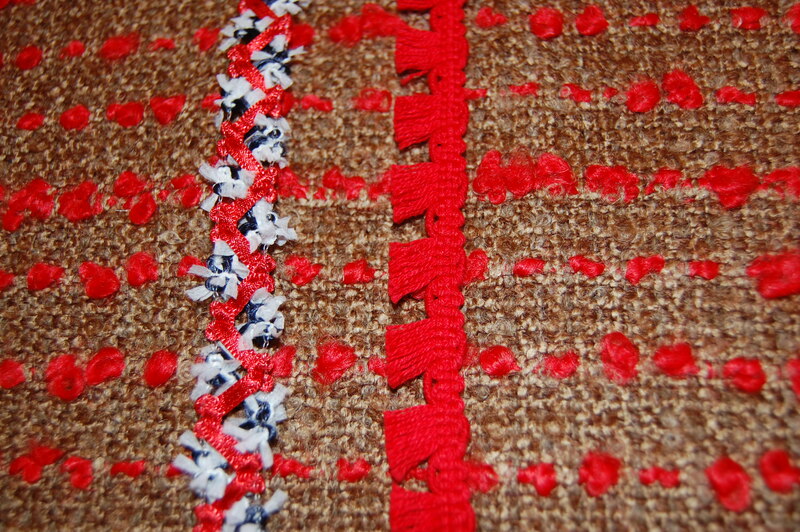 Hand understitching looks just so much nicer than machine stitching! 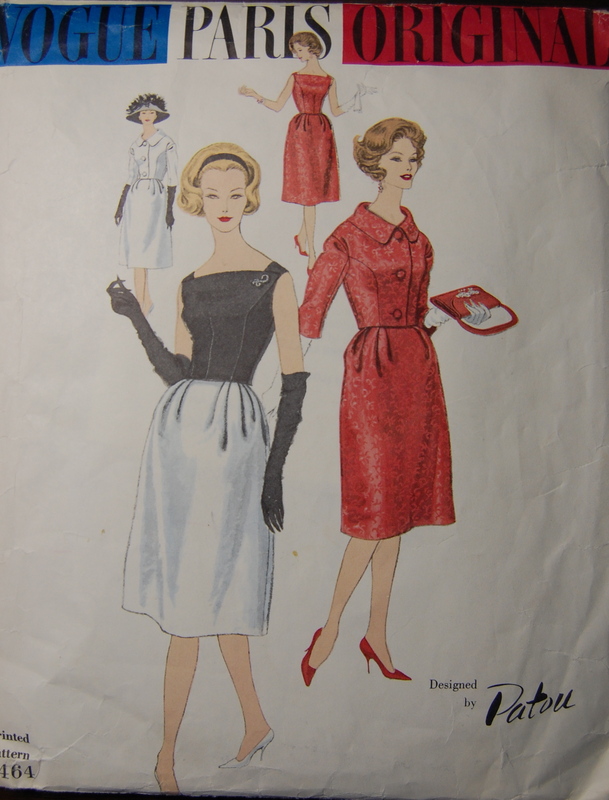 The instruction sheet from the pattern . . . . The vent sewn on . . . .
. . . . and the finished vent. 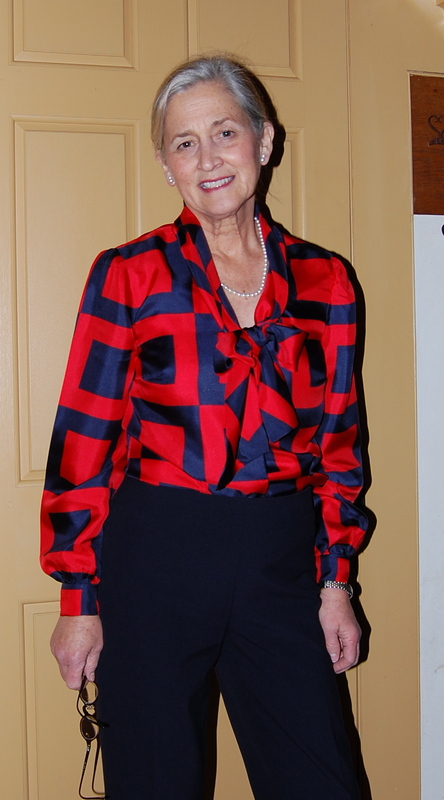 Another classic vintage aspect is the proscribed use of snaps – in this pattern, at the waist and below, which takes bulk away from the “tuck-in” part of the blouse. And that bow? Once I had it made up, was it too much? I think the bow is just about perfect. I am very glad I didn’t tinker with the size of the bow! 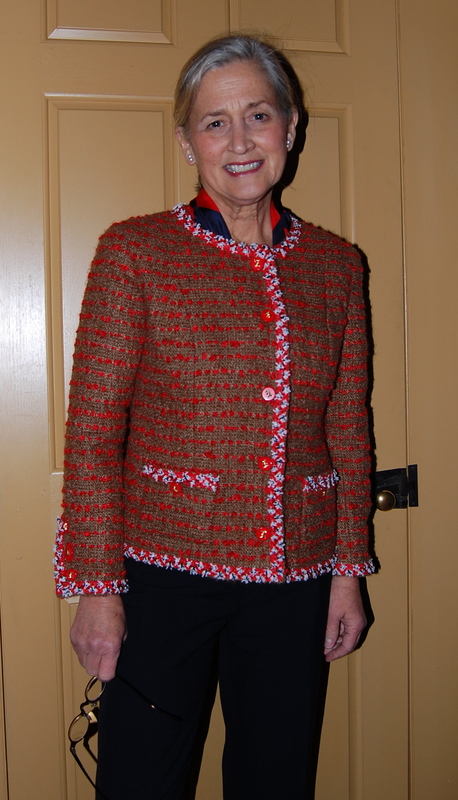 Shown with the jacket. 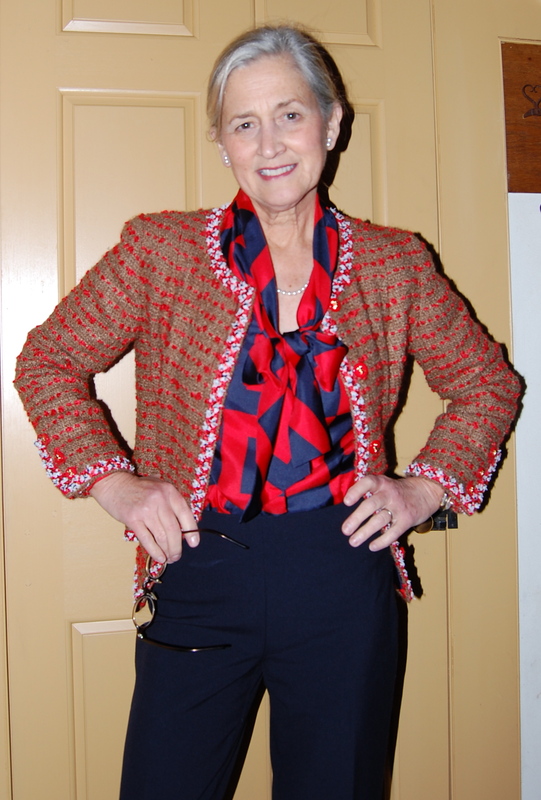 I really like how the collar on the blouse shows a bit when I have the jacket on. Whew! 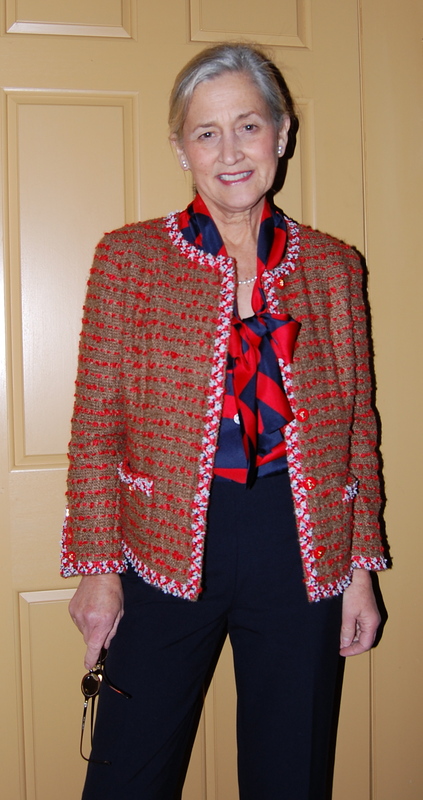 Blouse and jacket turned out as I had hoped! 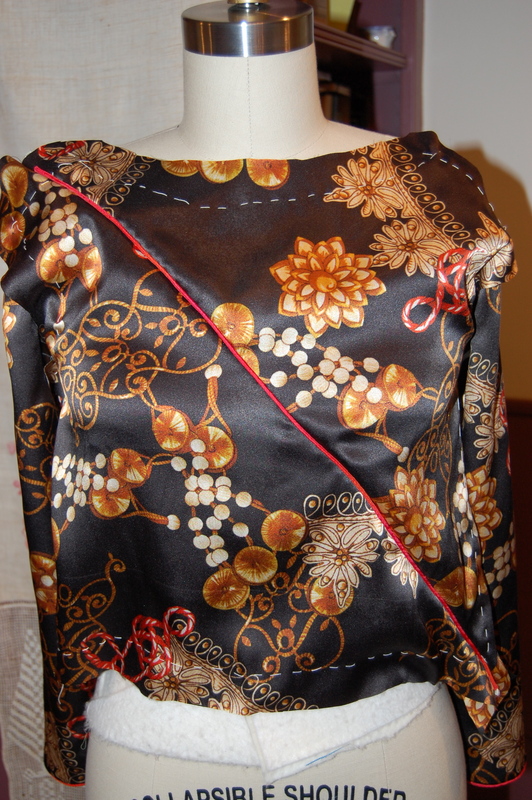 I am feeling quite good about indulging in the extra fabric and extra time needed to make this blouse. Now that my No. 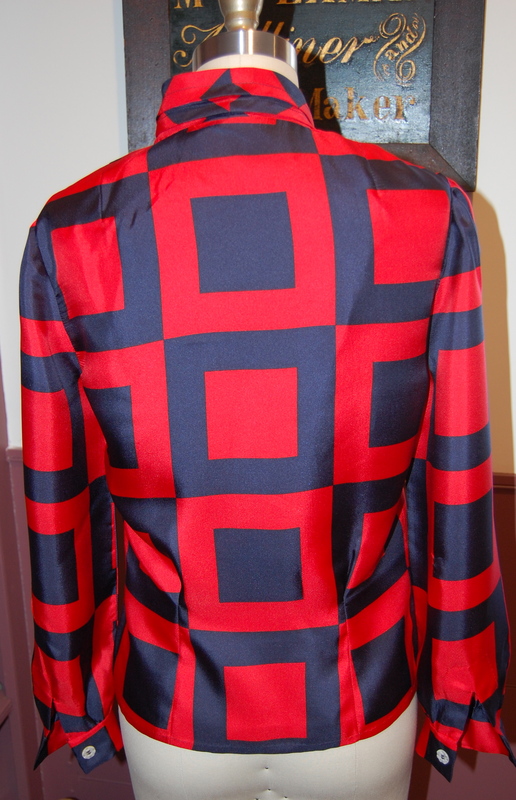 2 Jacket is complete, I can indulge in my other current project – my color-blocked coat – which might add a new word to the vocabulary of fashion sewing – obsession! I may – or may not – find Chanel No. 5 Paris Parfum in my Christmas stocking, but Chanel-inspired, Classic French Jacket No. 2 can currently, definitely, be found in my sewing room. Well, actually, it’s not a jacket yet. It is just lengths of fabric and loose trims and buttons, but that is how these things begin, as every home dressmaker knows. 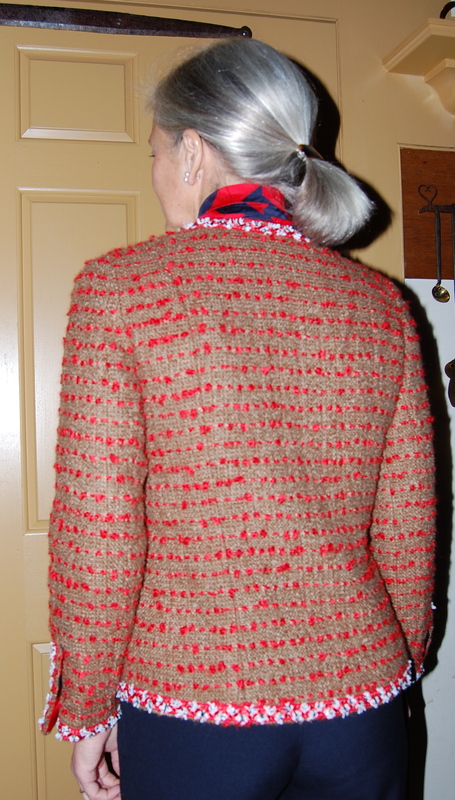 I actually started planning this jacket long before I took the Classic French Jacket Class with Susan Khalje this past summer. 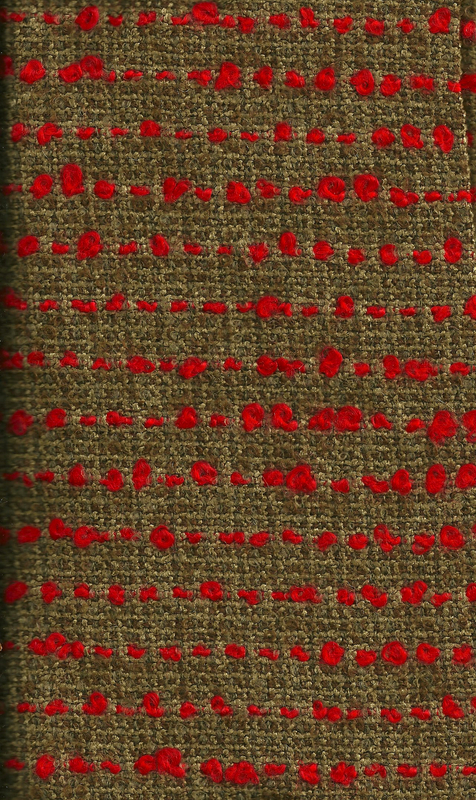 In September of 2012 when I was at Britex Fabrics in San Francisco, I found this boucle and purchased it – even then – as my intended Jacket No. 2. My first jacket is definitely very dressy, so I wanted this one to be less so, which meant I had to find just the right lining, trim, and buttons. It took another, recent, trip to San Francisco to produce those ingredients – and I couldn’t be more pleased with what I found again at Britex. 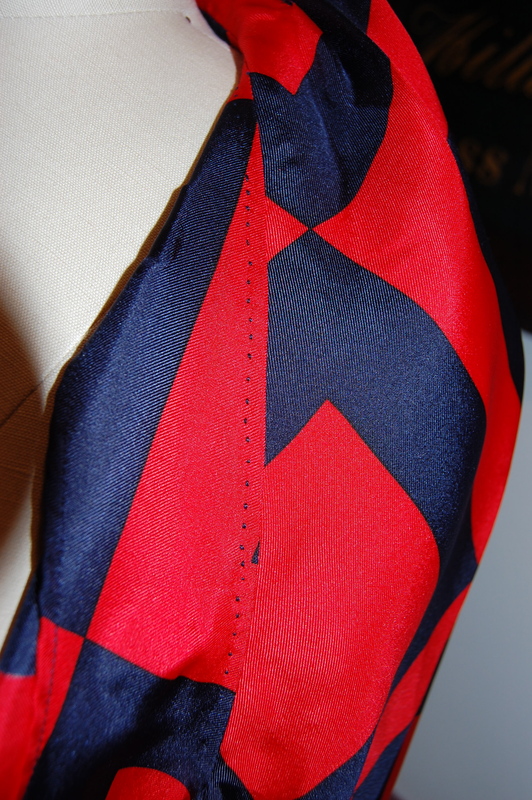 A bolt of this light-weight silk twill was tucked under one of the front tables, and it was love at first sight. 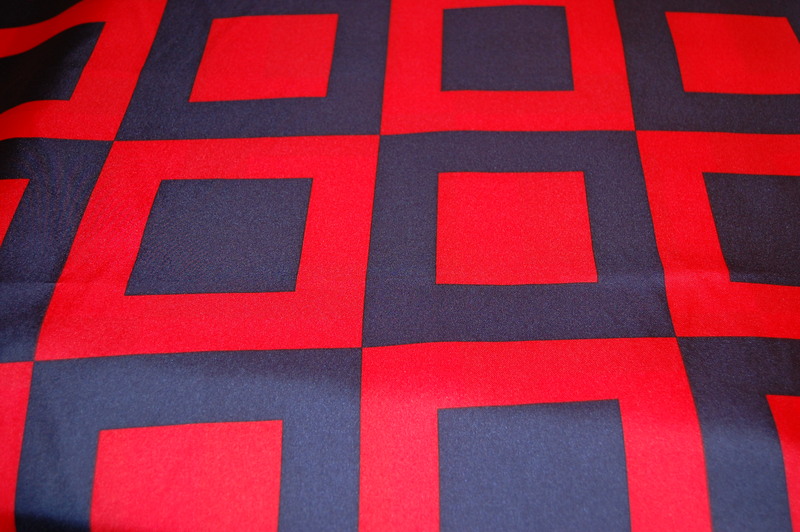 I was hoping to find something with navy blue in it, and the geometric pattern in this fabric makes it bold and less dressy than a floral silk charmeuse would be. 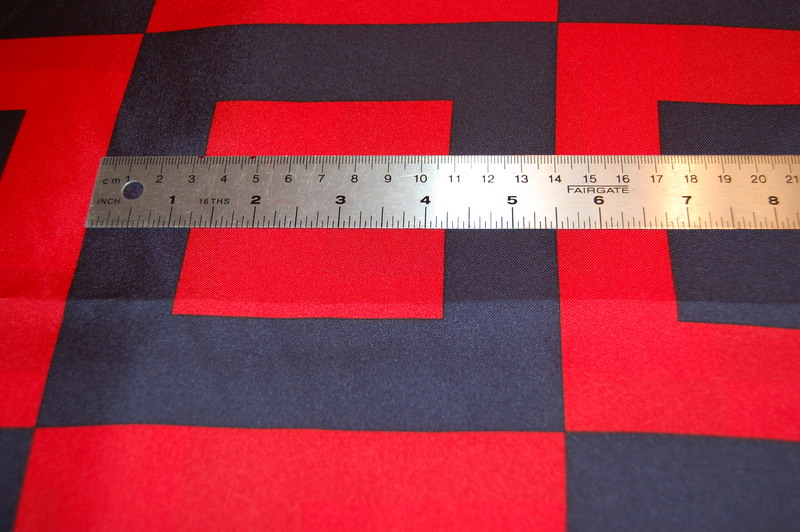 The ruler will help you get a feel for the size of the squares. Click on the photo for a close-up view. View B with long sleeves has my vote. 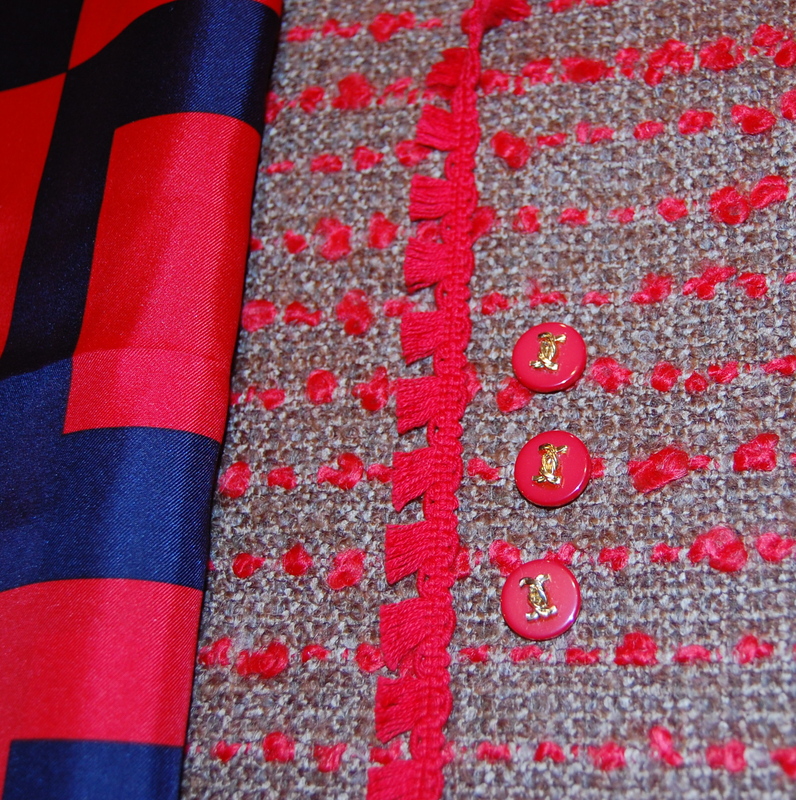 With fabrics in tow, I then headed up to the Buttons and Trims Department on the 3rd floor. 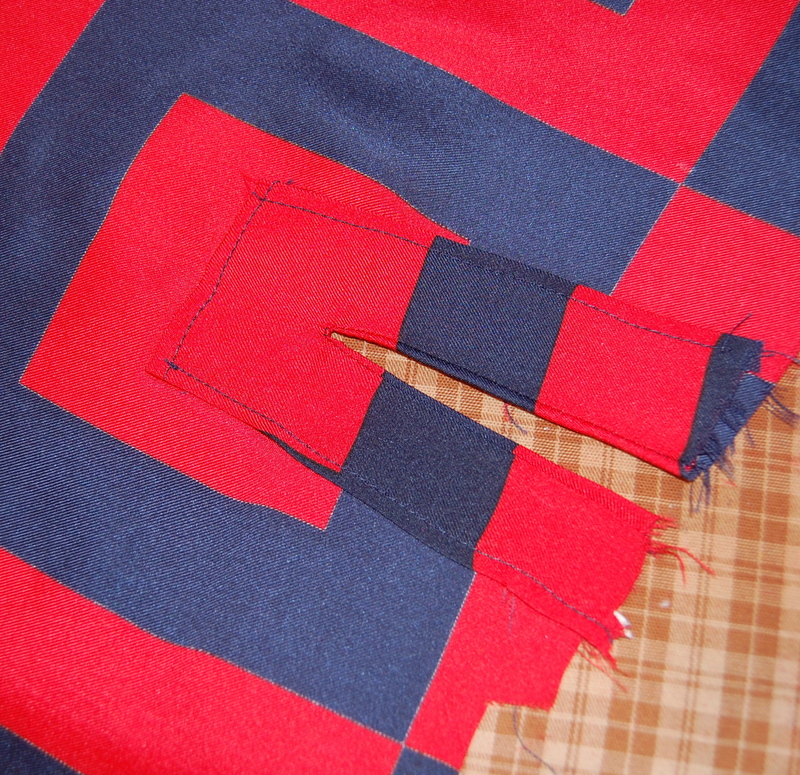 An initial look at the red trims flummoxed me, as none of them seemed right. Then one of the wonderful assistants in the Department came to my rescue and found these two trims. 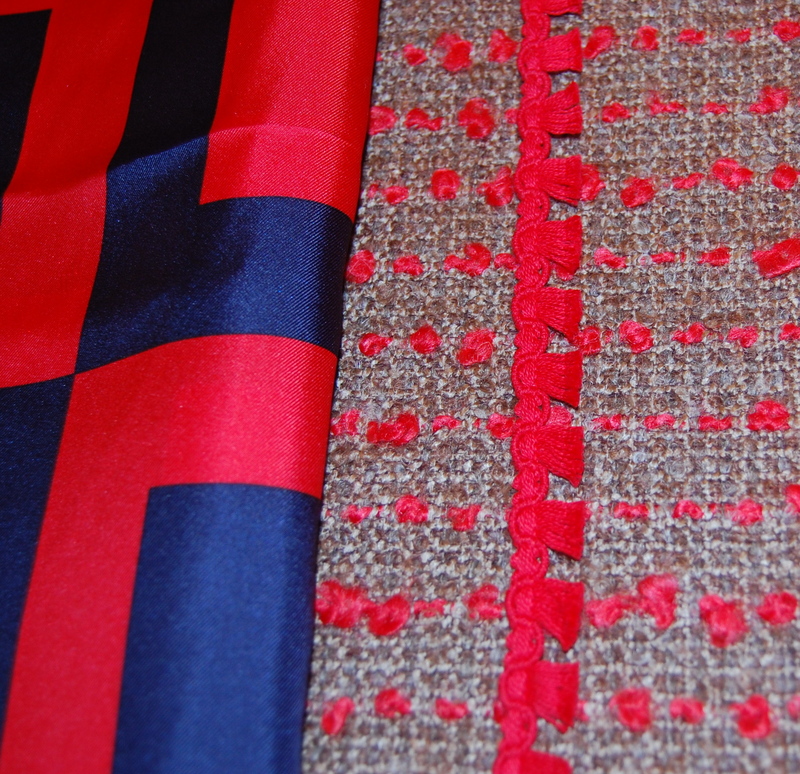 Shown with the lining/blouse fabric . . .
Now that I have them home, I am leaning toward one of them – can you guess which one? Does it help to see the buttons, too? Once again, the experienced button assistant quickly found these – and there was no question in my mind that they were just what I wanted for this jacket. 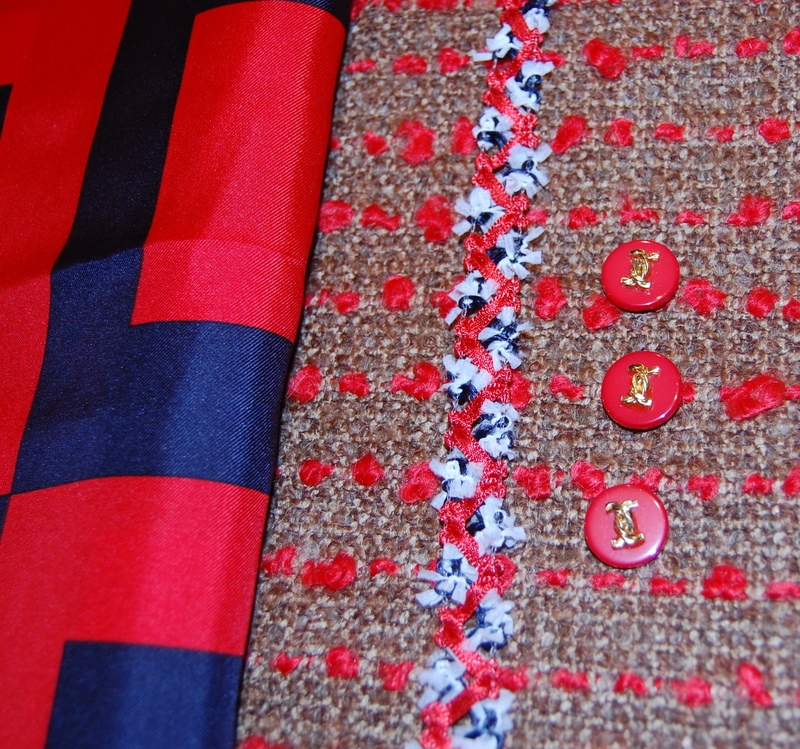 These are shank buttons, with gold decoration slightly reminiscent of intertwined Chanel “C”s. And here with the other trim. Well, as in so much in life, timing is everything – or it sometimes seems that way. My timing could be better to be starting such a lengthy project. It is, after all, one month until Christmas. I have those proverbial stockings to fill and much to do, but I’ll just bet I can squeeze in some sewing time before my sewing room transforms into Santa’s workshop.